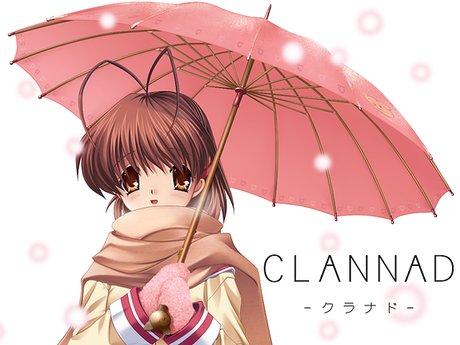 Clannad is a Japanese Visual Novel created by the company Key which is known for its other titles such as Air and Kanon. 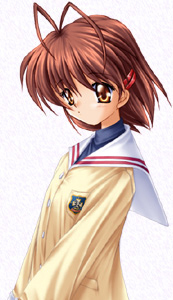 Clannad, unlike its predecessors, does not contain any adult content but instead, focuses on the relationships between the characters. 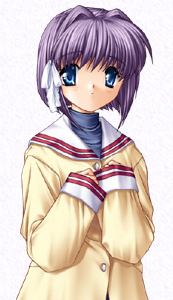 Clannad's story revolves around Tomoya Okazaki, a third year high school student who dislikes his life. Tomoya's mother (Atsuko) died when Tomoya was young, leaving his father (Naoyuki) to raise him. After the accident, Tomoya's father turned to alcohol and gambling, and held frequent fights with his son. One day, Naoyuki, again arguing with his son, slammed Tomoya against the wall, dislocating Tomoya's shoulder. Ever since then, his father has treated Tomoya nicely, but distantly, as if Tomoya and he were strangers rather than a family. This hurts Tomoya more than his previous relationship with his father, and the awkwardness of returning home leads Tomoya constantly to stay out all night. 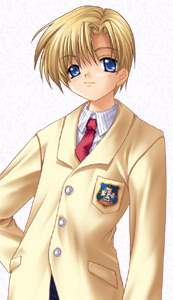 Additionally, the injury disables Tomoya from participating in his basketball club, and pushes him to distance himself from his school and other activities. Thus his delinquent life begins. Tomoya's good friend Youhei Sunohara, who got thrown out of the soccer club for a dispute, is also a delinquent and often hangs out in his dorm room with Tomoya doing nothing much. The story opens on Monday April 14, 2003 at the beginning of the school year, when Tomoya meets by chance Nagisa Furukawa, a soft-spoken girl one year older than him who is repeating her last year in high school due to being sick much of the previous year. Her goal is to join the drama club which she was unable to do due to her sickness, but they find that the drama club was disbanded after the few remaining members graduated. Since Tomoya has a lot of time to kill, he starts to help Nagisa in reforming the drama club. During this period, Tomoya meets and hangs out with several other girls who he gets to know well and help with their individual problems. In After Story, which starts immediately after the end of School Life but extends into the next ten years, Tomoya and Nagisa live together as a family. 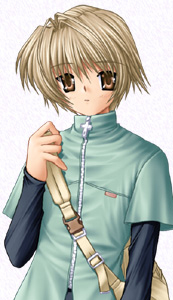 Tomoya has to endure several hardships that the family has been suffering from, mainly involving Nagisa's illness. The order of the last three (Fuko -> Toshio -> Nagisa) is very important, if you don't follow this order you will miss a few scenes in both the main story and the after story. 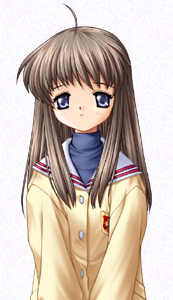 Misae and Tomoyo are very close friends, and it'll be better understood if you play the Misae's route before Tomoyo's route. 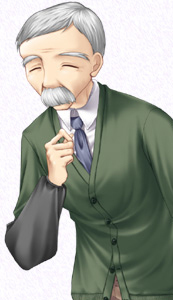 Ryou's route should be played before Kyou's route, as Kyou's is just the continuaton of Ryou's route. 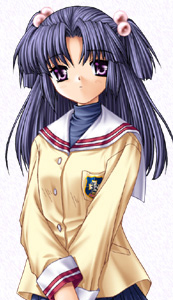 Kotomi's route is actually very independent of other everyone else's route, but it is better if you play it before Nagisa's route. The '*' marked choices are the essential ones. For any other choice you can choose what you want for different dialogues. The number inside the square brackets "" tells you the number of the choice (So  would be choice 2). be required to cause Akio to appear and complete the combo though. hit him so hard, his face disfigures each time! 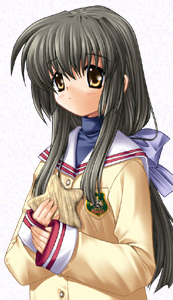 points in Tomoyo's path. STARFISH HEAT! Yukine and trying the spell to see what happens! Answer: Why you ask this? Which type of guy you like? What type of drama is going to show? The '(1)' marked choices affect what happens in the after story. The '(2)' marked choices are essential for more characters to show up in Nagisa's graduation's after story. What's that on the poster? At the beginning there are no choices. Save at the first week when Tomoya lives together with Nagisa. Save on the day your daughter is born. No choices will appear here yet. Only after week one of After Story is finished with 13 lights will there be a choice for you. Return to this save when you've fulfilled the requirements. In Yukine's route there are 'spell games' that you can play on the 23rd and 24th of April. There are many different variations to the storage curse. Here is the list of Characters you can have fun with!! Sometimes you are prompt to read manga or play a ‘Doki Doki High School’ mini game. Check here for guide!! this is rather silly, but very funny and I recommend enjoying it!~! 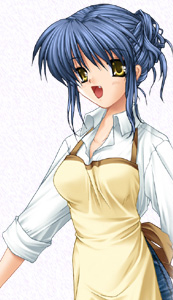 In Mei Sunohara's route you'll have to find Sunohara a girlfriend. You'll end up with Sanae in the end no matter what but here are some other fun options. Throughout the Ibuki Fuko route you can play pranks on Fuko but here are some things you'll have to pay attention to. (*)On April 18, sleep in data room twice. That is, sleep -> talk with Yukine -> Sleep. During Nagisa and Toshio's route, there is a 3v3 Basketball Minigame where you can select your teammates. Attention: Fubayashi Ryou, Ibuki Yukine and Furukawa Nagisa as partner will result in a loss, giving you the Bad End. This is a fun route with Akio and other characters! It is possible to see the laser tag game with other options, but if you don't meet the criteria for the baseball scene, you will get a bad end immediately after the tag game. There are multiple outcomes to the baseball game, but these choices result in winning. There is a way you can cause Jet Saito to appear in two different places. The first few choices are the same, and split off once you decide where you want to see him. It's a one line cameo, but this is about the most random thing you'll ever see. There are a total of 7 versions of songs you can record into Sunohara's tape in the beginning of the story! Can you get it all? There are two versions of songs Sunohara will sing on the 15th. That depends weather you mess up his tape or not. 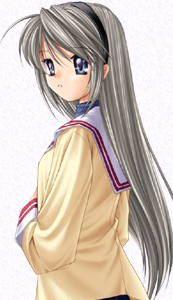 Complete After Story once and return to Tomoyo route. Sunohara's face will deform at some point when beaten! 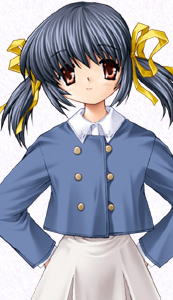 In Fuko's route, do various pranks to get the title Fuko Master and eventually Fuko Ninja and you'll have Fuko appearing like a ninja when you replay Tomoyo's route. 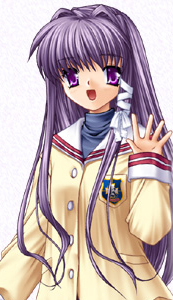 This walkthrough is taken from the Animesuki Forum and the 300 hour Clannad Guide, with minor changes/improvements added by me.